"Give us the same information that our doctors have but in easy to read and understand language – taking Greek language to Street language." "Give us education programs that make us more active participants and decision-makers in our own care." "Help us become the “quarterback” of our health care team." We hope we’ve done that and we will continue to keep your needs and goals in the “driver’s seat” at ACE. For 18 years, ACE has been breaking new ground for the over 5 million Canadians living with arthritis to help them in their disease journey. We’ve developed the first arthritis patient web site which is updated monthly; launched and keep current 2 mobile apps; run seven social media channels to make it easier for you to stay connected to arthritis news, research and events. Our small team of eight staff members come to work every day with you in our hearts and minds. But while we “do the work”, each one of you has contributed to making ACE what it is. We rely on you, the person living with arthritis or those working or caring for you, to drive the organization’s agenda. We THANK YOU for answering our surveys and communicating through Facebook and Twitter your specific needs so that our information and programming remains relevant to your lives, to your journey with arthritis. We currently are seeking your responses to questions in our Biosim•Exchange. 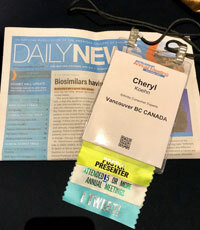 As I get ready to return from the 2017 American College of Rheumatology meeting – my 16th in our 18-year history – I’m reminded to tell you how thankful ACE is to learn from and work with top rheumatologists, physical and occupational therapists and other allied health professions from around the world. We see first-hand how they work to uncover the mysteries that drive the over 100 types of arthritis that we live with. Many of those are Canadians. I’m so proud of our community and all that we’ve accomplished, but so much more needs to be done. As their work unfolds, with us by their side actively engaged and leading patient-oriented research, we will deliver to your inbox, mailbox or social media channel, their findings and how to incorporate them into practice in your life with arthritis.